PRO: Signed with the Riders in May, 2018…selected in the 2nd round (14th overall) of the 2018 CFL Draft. 2018: Played 11 regular-season games…registered seven special-teams tackles. 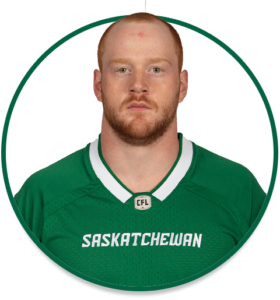 COLLEGE: Spent four seasons at the University of Calgary (2014-17)…played in 30 regular-season collegiate games with the Dinos…had 111 unassisted tackles, 14.5 tackles for loss and seven quarterback sacks…won back-to-back Hardy Cup titles as Canada West champions in 2016 and 2017…played in the 2017 U Sports East-West Bowl…named Canada West All-Star in 2015 and 2017…named U Sports All-Canadian in 2015.